I don’t think I’ve liked a comic this much in a long time. Sure, there’s been books that I was really happy that existed, like when the new Guardians of the Galaxy series launched a few years back. 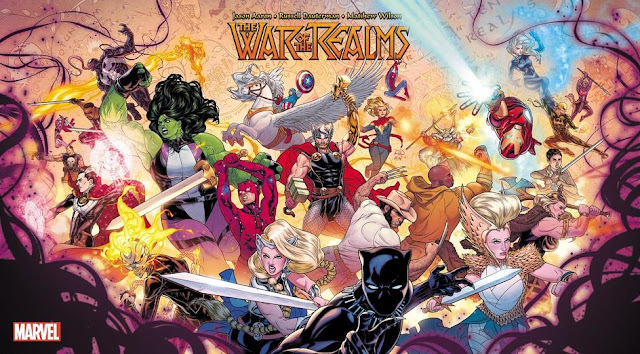 I enjoy that book a great deal, among many other comics that are coming out on a monthly basis at your local shop or authorized digital provider. However, it’s a book like this that reignites my love for comic books in a special way. 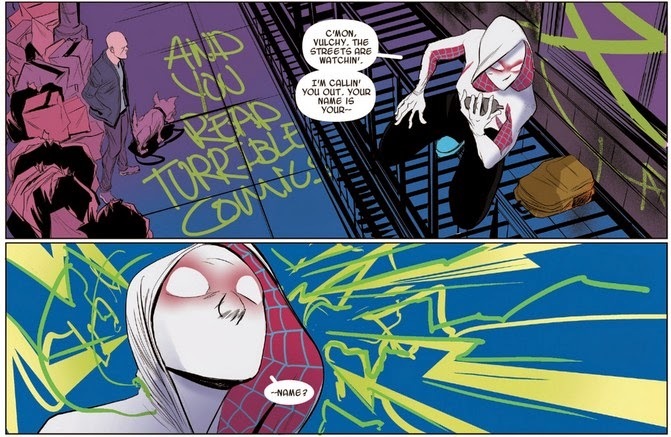 Every so often I ask myself, I say “self, are you sure you should still be reading comic books as a 37 year old married man and father of two boys?” Spider-Gwen is a perfect example of why the answer always comes back as yes. 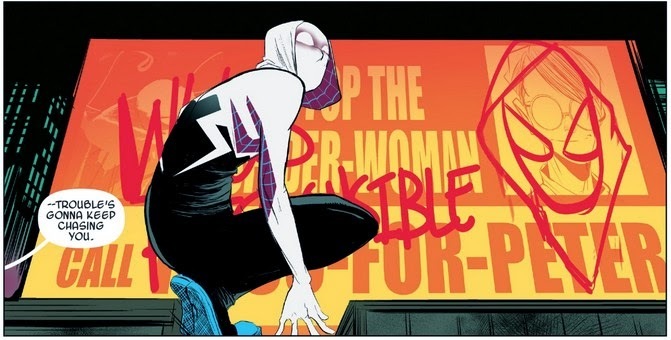 My expectations could not have been higher after Edge of Spider-Verse #2, and yet Latour, Rodriguez, Renzi, and the rest of the creative team have managed to not only deliver on the promise of that first story, but improve upon it. As I’ve said before, I’m not much for reviews, so instead I’m going to give you some thoughts. First off, I forgot to mention what was possibly the most important detail of an outstanding first issue, something I failed to mention in my previous “review.” My love for the HBO TV original series The Wire is documented. It is my opinion that it is in the pantheon of the all-time greatest in televised entertainment, and makes a great case for the best TV show of all time. I know Latour likes the Wire too, because he’s said so on social media, and I can read. 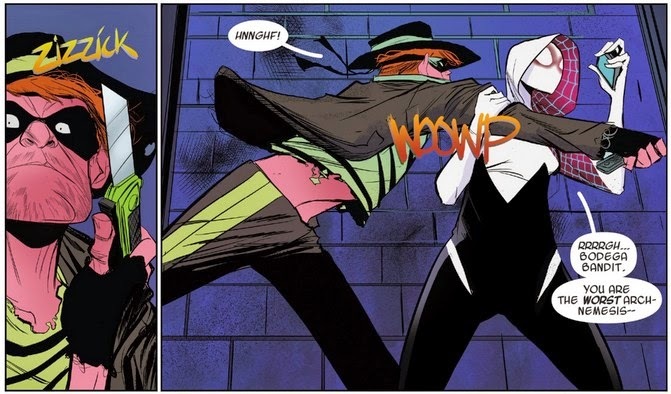 It’s also been brought to my attention that Spider-Gwen’s arch-nemesis might be the Hamburglar. Spider-Ham is one of my favorite absurd characters. His recent prominence in the pages of Spider-Verse, as well as solo series for Doop, Squirrel Girl, Rocket Raccoon, and Howard the Duck, makes me really think Marvel is specifically targeting me as a customer. 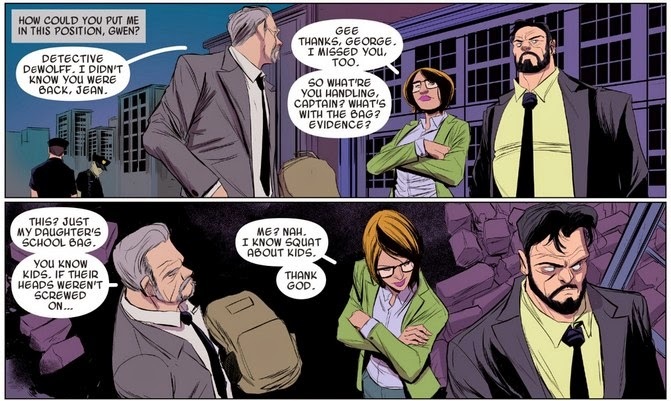 Anyway, Spider-Ham could have been just a joke appearance, and while there are plenty of laughs, there’s also some wisdom hidden underneath the laughter. That’s a level of depth you wouldn’t necessarily expect from a hallucination of a taking pig with spider powers. It’s just one of the many reasons the book works on so many different levels. 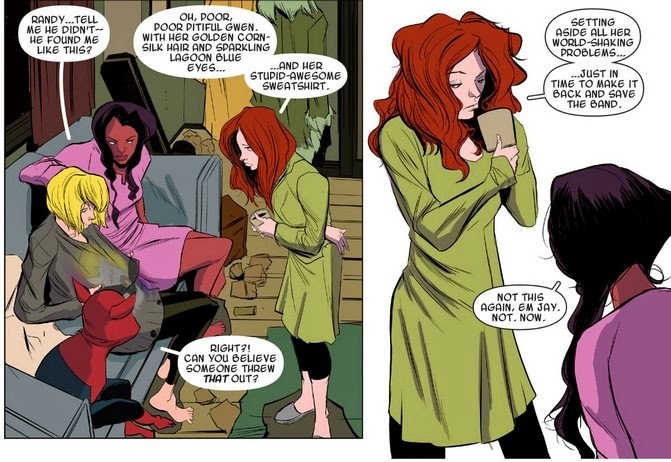 I’ve gleaned that there has been some talk from Mary Jane fans, upset with her depiction so far in the series. First of all, you had Mary Jane in the spotlight for twenty years in the spider books, its Gwen’s turn. Second, I see no problem with her depiction. Third, it’s only been two issues, let them tell their story. Lastly, get over it. 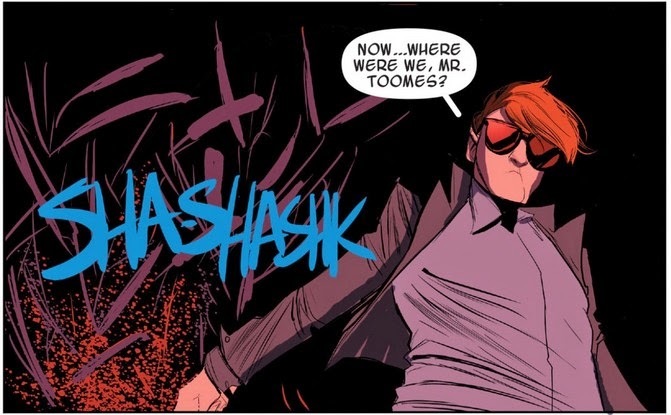 What we’ve seen of Matt Murdock in this universe so far has arguably been as intriguing as Spider-Gwen herself. He’s ruthless and driven, and I’m beginning to suspect the Kingpin he is referring to isn’t sitting in any jail, but is instead smashing birds with his cane. Time will tell. I’m going to assume The Black Cats is another band, and this means that if there’s isn’t a band showdown against the Mary Janes at some point in this series, I can only consider it to be a massive failure. I’ve said before, I haven’t historically liked the twists on familiar characters that most prior alternate universe stories have used. Most often it’s a case where everyone is a kid of the Marvel characters we already know and love. Or there’s this heroic character, only he’s evil now. That exists in this book, but it’s executed so well, that it isn’t a detriment. Every character is so fully realized, even in the space of a few panels, that you can’t help but accept them as fully authentic characters. Frank Castle as the cop on the verge of coming unhinged fits with what we know about him as the Punisher. He’s a physically imposing brute of a man too, but with a look on his face that suggests there is more going on in his head than his few words might convey. George Stacy is going to be great as the good cop struggling with a daughter that is a vigilante, but also doesn’t return his calls. A daughter that is growing up. I want to know more about these characters. I want to see what happens next. The writing and the art are spectacular, and the coloring is phenomenal. So far, it’s been a perfect book. I have nothing to complain about. There aren’t many books that can inspire this level of passion in me, especially since I haven’t had a good night’s sleep since my children were born. I’m frequently in a state that’s a mixture of sleep deprivation and coffee overindulgence, so anything that can make me smile should have the highest of praise heaped upon it. I cannot say it strongly enough. You need to read this comic. I’m ready for the re-up, when does #3 come out?